Appearing around my corner of the Internet recently is the Slate.com column, "I’ve Read 500 Cover Letters for Entry-Level Media Jobs: Here are 12 tips your career counselor hasn’t told you," by Katherine Goldstein. People love articles about how to write a good cover letter because the process seems mysterious. Creative commons licensed image by Flickr.com user AlisaRyan. Many people share this sentiment. I’m not interested in anything you did before college. Leave anecdotes like this out: "I am a born storyteller, and I’ve loved writing ever since I won an award for playwriting in the third grade for my series of puppet fairytales." Goldstein is right; high school is a lot like Vegas. What happened there needs to stay there. Employers care about what you have done lately. Still, even during the junior year of college, students cling to high school accomplishments because sometimes they were big accomplishments. Isn’t being Valedictorian of your high school class a lot more work than, say, a three-year membership in the student investment club where your biggest responsibility is showing up? When I tell students that it’s time to delete those high school accomplishments from their resumes as well as the fact that they went to high school at all, the advice is met with mixed emotions. I have essentially said that the first 90% of their lives really no longer matters. This week, I led everyone to the Goldstein article and pointed to it as evidence. The problem with these “mistakes” style articles in general, including this one, is that they point out problems or make crazy assertions (Really, Forbes? A sparkly cover letter? See below...) and leave the question, What do I do instead? flapping in the wind. No one ever explains what to do instead. Sparkly? As in an effect achieved with glitter glue? Put away your Bedazzler. I will tell you how to write a cover letter. First, a cover letter needs to look like a cover letter by following a business letter format. Second, cover letters typically have four paragraphs, and I am going to tell you what to put in each of these four paragraphs. Paragraph 1: Write two sentences. Sentence 1 should identify the position for which you are applying. The second sentence should include a “thesis” statement that foreshadows the next two paragraphs. I am writing to apply for the information development position advertised in the Boston Globe on March 15. My internship experience at Alegro Electronics, Inc. and technical writing coursework at the University of Maine have prepared me for this position. Think of the second sentence as a “thesis” sentence. It provides an outline for the rest of your letter. Your reader will expect one of the next paragraphs to discuss the internship and one to discuss something really interesting that has happened during your education. Paragraph 2: Discuss one of the topics—internship or education. This paragraph should be longer than the first paragraph. For Paragraph 2 and 3, use examples. Show that you know things by explaining how you used a concept that you learned in class or by describing a project that you did during your internship. Paragraph 3: Discuss the second thing topic—internship or education. As Goldstein points out, no one wants a list of coursework. What people want to read instead is something interesting that happened during your internship or education, not a summary of the whole experience. At Alegro Electronics, I worked on a small development team to document platform features and APIs. Alegro uses an Agile development process, and I participated in planning meetings. After participating in training to develop a technical understanding of the platform and toolset, I worked independently to identify outdated information and gaps in existing documentation. I made recommendations to the team for improvements to the documentation. I drafted improvements to the documentation. My coursework at the University of Maine prepared me for the internship at Alegro. In my User Documentation course, we documented software being developed by a spatial engineering research unit on campus. I learned to create online and print manuals, and I used MadCap Flare to build user documentation and online help. Each phase of the project was planned collaboratively using an Agile development model. These two paragraphs are all about you and your qualifications and they need to be written carefully so that you describe what you can do in terms of what the job requires. (I’m pretty sure this is what Forbes means when referring to the “sparkly” parts.) Try to pick examples from your internship and education (or the two topics that you select) that best match the job advertisement. This letter would not be right for a position as a grant writer. Again, use examples of your work to show you know how to do things closely related to the job for which you are applying. These two paragraphs are really about showcasing your skills in the area that the employer needs so that the employer thinks We could really use this person. My resume is enclosed. I look forward to hearing from you. Strangely, people really mess up this last paragraph. They will say things like, “I can be reached at this number on Tuesday and this number on Wednesday.” Or, “I would like to negotiate a flex-schedule because I have four dogs who need walking several times a day.” Even if you do need a legitimate accommodation, do not negotiate it in the cover letter. 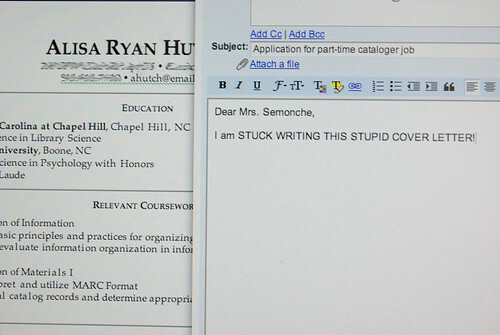 Being able to write a traditional cover letter shows that you understand the genre of application letters. Creative cover letters and letters that are too long, too chatty, or even too short, give the impression that you are not familiar with typical types of business correspondence. There are so many articles available online but you shared a signification information regarding this topic.Very good suggestion and tips in this post.